Asking for votes and support, negotiating for bipartisan agreement in the Senate, speaking up for the victims of sexual harassment in the military, then cooking dinner at home for her toddler sons at the end of a long, hard day. 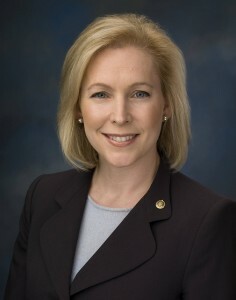 New York Senator Kirsten Gillibrand does it all with determined courage, near-evangelical confidence and the tenacity of…a honey badger. After reading her memoir Off the Sidelines, I’m moved and inspired by her tireless quest to be the voice for the voiceless and to fight the lost causes. She was influential in repealing ‘Don’t Ask Don’t Tell’ the policy that banned gays from serving openly in the military, and providing health care and compensation to the 9/11 first responders and community survivors who are sick with diseases caused by the toxins at Ground Zero. Her book and her example are a strong call to action for women to speak up, get involved, and ask for change. I feel challenged to think bigger and take bolder action. It makes me wonder, have I done enough? What more can I do? Who else can I help? It’s like being shoved out of the mindset of complancency; it feels uncomfortable, not unlike when I have to muster the courage to negotiate. We decided we would use the holiday face time to lobby. For the hour Jess and I stood in line, I kept second-guessing myself, asking whether Jess thought it was rude or obnoxious to spend my thirty seconds with the president at the Christmas party to urge him to throw his weight behind ensuring that our 9/11 first responders got their due. “Yes, Kirsten, you should bring up the bill,” said Jess patiently, at first. “Is it rude?” I asked, feeling insecure again. Lobbying here among the fancy Christmas trees was clearly off script. “I don’t know,” Jess said. The president broke into a bemused smile. “Kirsten…Kirsten…happy holiday.” His body language urged me to please slow down. Come check out the new site! Should You Negotiate for the Sake of Negotiating?